Step 1 Toast the mustard seeds in a small skillet over medium-low heat just until they start to pop, 2 to 3 minutes. Place in a large nonreactive container with the ale, salt, maple syrup and rosemary, stirring until the salt is dissolved. Add the chickens, placing a plate over the chickens to weigh them down in the container so they stay submerged in the brine, and cover. Refrigerate the chickens overnight. Step 2 The next day, remove the chickens from the brine and brush off any mustard seeds or rosemary bits. In a small bowl, combine the paprika, salt, onion powder, garlic powder, sage and cumin to create a rub. Step 3Lay the chickens, breast-side up, on a rimmed baking sheet or cutting board. Sprinkle about 2 tablespoons of the rub over each chicken, and begin to massage the rub all over the surface of each chicken. Flip the chickens over and sprinkle over a little more rub, massaging it into the skin. The rub will stain the skin of the chickens a rich reddish-orange as it is rubbed on. Once the chickens are rubbed, sprinkle a teaspoon or so of additional rub into the cavity of each chicken. Fit each chicken over an empty beer can, chicken rack or stand. Step 4Prepare a grill for indirect cooking, and heat so the temperature registers around 350 degrees. Carefully place the chickens on the grill rack, away from direct heat. Cook the chickens until a thermometer inserted in the thigh reaches 165 degrees, about 11/2 hours. 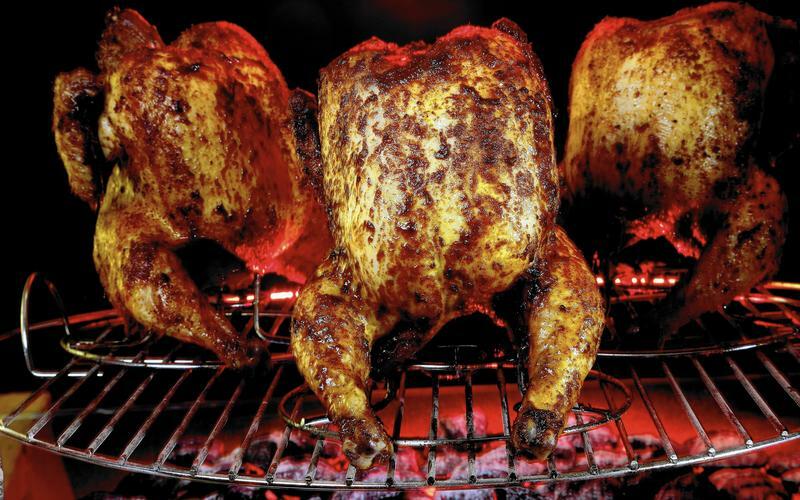 The chicken can also be cooked in a 350-degree oven; place a drip pan on a rack underneath the chickens to catch juices. Step 5Cool the chickens slightly, then carefully remove the cans or racks. Cut the chickens as desired and serve immediately. In Recipes-list.com we have selected the most viewed recipes from category - Main courses . Enjoy the best recipes specially selected for you! Drunken chicken is the right choice that will satisfy all your claims.